In the past few weeks I have been struggling to manage intense emotions. Even with my steady mindfulness practice there have been some life challenges that have affected me in ways that I am not enjoying, like at all. I have noticed myself becoming reactionary and quick to think of the worst possible scenario. Yuck. It does not feel good to be living like this. Because I teach my students at school how to recognize and cope with difficult feelings I feel an obligation to try out new coping techniques and stay up on my own mental health so that I can be genuine and helpful when teaching others how to manage their stress. I recently started something new and I would love to share it all with you. It’s called labeling. It’s actually quite simple: When you feel an intense emotion come on (either positive or negative) instead of trying to figure out what to do with it, you simply label it. For example, let’s say you and your spouse are having a disagreement about the dishwasher or division of labor (because, ahem, no couple is immune to these types of disagreements) and you notice that your fists are getting tight and that you want to spout off a sarcastic or rude remark. When you notice these sensations, say to yourself “anger” and repeat it over and over until you notice the intensity start to subside. I swear to you, it helps! By labeling what you feel in the moment, it forces you to push the pause button and occupy your mind with something other than what’s happening right now. And when you take that pause, your brain will communicate with your body that it knows exactly what is going on (since you identified it) and that fight and flight response coming from your amygdala will subside. I also do this when I am with my daughter, Winter. 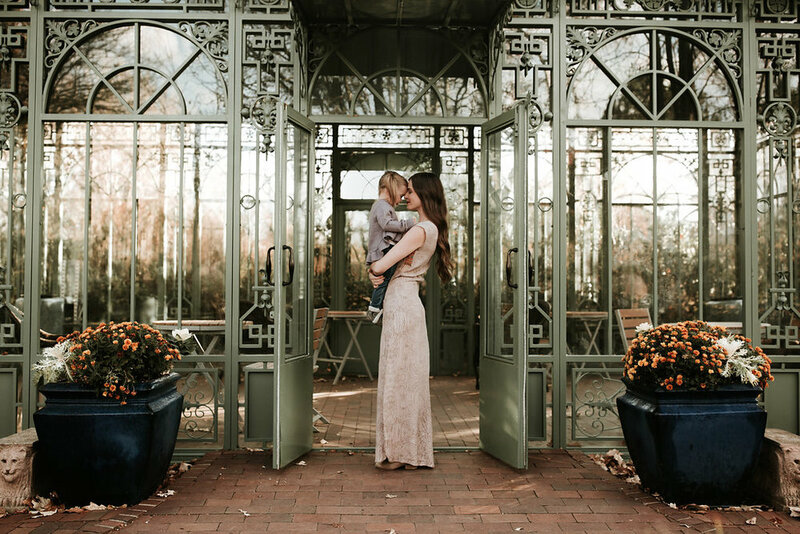 For example, on this shoot, we went to the Denver botanic gardens and had three shoot concepts in mind. Winter was so over the moon excited about the gardens that she wanted to run around, refused to be held and wanted nothing to do with shooting (and rightfully so!). I would never make Winter do something that she didn't want to do, so it was an easy decision for me to let go of my expectations and just enjoy the gardens with her. But, I would be lying if a few thoughts didn't cross my mind about deadlines. When I noticed myself starting to make a list and begin brainstorming all the things we would have to reschedule, I began to feel a bit anxious, and it took me away from being in the moment with her. My mind began having what I call "popcorn thoughts" which are random thoughts that come up and distract you from the present moment. Instead of trying to fight them or on the contrary, allow them to happen and get more stressed out, I labeled them. I said to myself, "thinking," "list making" and "anxiety." It was incredible how once I labeled them the emotions attached to them started to fade away. Within a few minutes, I was able to be fully present, and we had an absolute blast at the gardens. So the next time you feel intense emotions, try labeling them. I promise you; it's going to be a trick you'll want to put into your tool belt to pull out from time to time. My sweet mom came out for Winter's birthday. I love this shot of them. Winter was having a rough time and needed a quick break so a Sesame Street song it was. Grandma to the rescue!! *This gorgeous dress is from Yireh, a socially conscious and ethically made clothing line. It was hand designed by my new friend, Emily. The clothes are manufactured in Bali and every employee that makes them are paid fair wages, receive one-month paid vacation, religious holidays off, sick leave, and medical insurance. Each print is screen printed by hand using all natural dyes. Surplus fabrics are given to local Balinese charities to minimize textile waste. I cannot believe the thoughtfulness that goes into this collection. Emily is just the sweetest, most raw person ever. She too has battled with bouts of depression and her love for others is palpable. Yireh also donates 10% of their profits to International Justice Mission (IJM.org), an organization geared towards bringing an end, as well as justice, to human trafficking. This dress is from her Streets of Gold collection. I love the detail under the arm so much. It's one of the most beautiful pieces of clothing that I own. If you are looking to treat yourself this holiday season, I highly recommend supporting Yireh and getting one of her pieces. She just launched the Crimson collection, and it's to die for! !